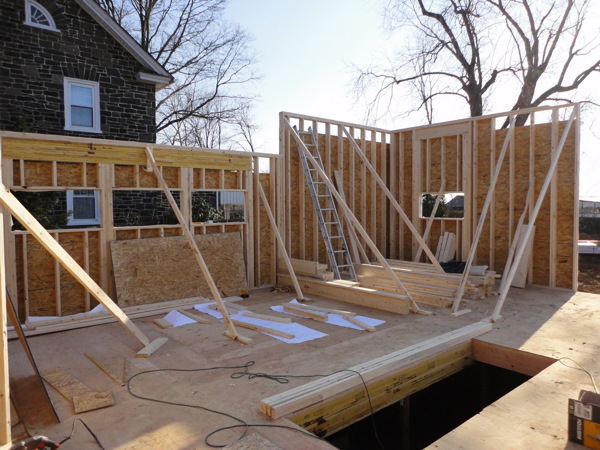 A quick transition to framing, and the walls are now rising quickly. The height of the walls here gives us a little clue about the relative ceiling heights. The rear portion of the house at the kitchen and living room enjoy an extra hight ceiling due to the master suite being a few steps up from the rest of the second floor. Stay tuned for more as the carpenters always seem to make short work of the framing. You'll find a photo-browser with more images after the link.